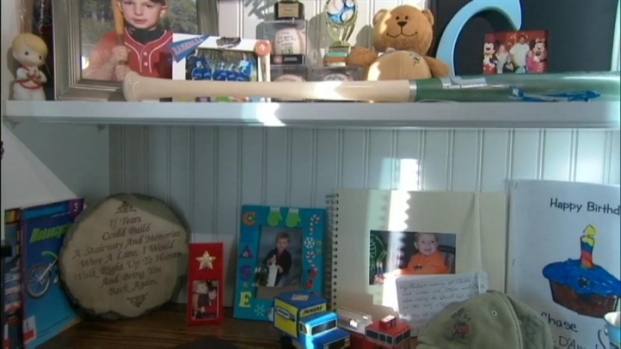 Chase Kowalski's family speaks ahead of the painful first anniversary of the shooting in Newtown, Conn.
For the family of a first-grader killed in the shooting rampage at Sandy Hook Elementary, sometimes it would be easier to just withdraw. As the painful anniversary approaches this weekend, the mother of Chase Kowalski visited a playground built in her son's honor, and described the family's pursuit to make his life count: They have built a memorial fund that sponsors pre-school programs and triathlons for kids, because Chase loved to run, bike and swim. "It would be really easy to just fold up and not participate in life, but we've got some great things happening that, you can't," Becky Kowalski said. "You have to share it and we have to make that vision a reality." Chase Kowalski's parents tell NBC 4 New York that they are summoning the strength, now more than three weeks after the shooting in Newtown, Conn., to talk and move forward because they believe Chase wants them to have a greater purpose -- to help others. David Ushery reports in this exclusive interview. Chase was the third child, and only boy, of Becky and Stephen Kowalski. He was among the 20 children slain at Sandy Hook on Dec. 14, 2012 by gunman Adam Lanza, 20, who had killed his mother at home before he moved on to the elementary school. The family has created the Chase Michael Anthony Kowalski Sandy Hook Memorial Fund, which his mother says has funded 135 scholarships for pre-school YMCA programs. Triathlons for kids are also planned, as well as a community center where families can exercise together instead of putting kids in day care while the adults work out. "Chase is changing the world -- I knew he would, I knew he could," his mother said. "And we're helping to make it happen." Donations can be made to the Chase Kowalski Memorial Fund through its website or Facebook page.